June 2017 saw the biggest NBN™ rollout yet with over 525,000 premises across Australia now ready to connect. That’s over 10.5 million premises that are now either connected or ready to get connected to the future of Australian broadband. At iiNet, we’ve been working with the internet since the dialup days and our experience has shaped us into the NBN™ experts. To date, the iiNet Group has connected over 250,000 NBN™ customers who, according to two major nationwide surveys, are the most satisfied NBN™ customers in Australia. You can check out all the details from the surveys here and here. iiNet came out on top receiving high scores for reliable connection, connection speed, value for money, technical support, customer support, bill clarity, and ease of setup. If you’re eager to get movin’ and your address is expected to be NBN™- ready within the next 3 months, you can pre-order iiNet NBN™ for a hassle-free switch and we’ll get your order rolling as soon as NBN™ reaches your door. Just pre-order your preferred plan now, then sit back, put your feet up and relax knowing you’ll be connected with a truly satisfying NBN™ provider. 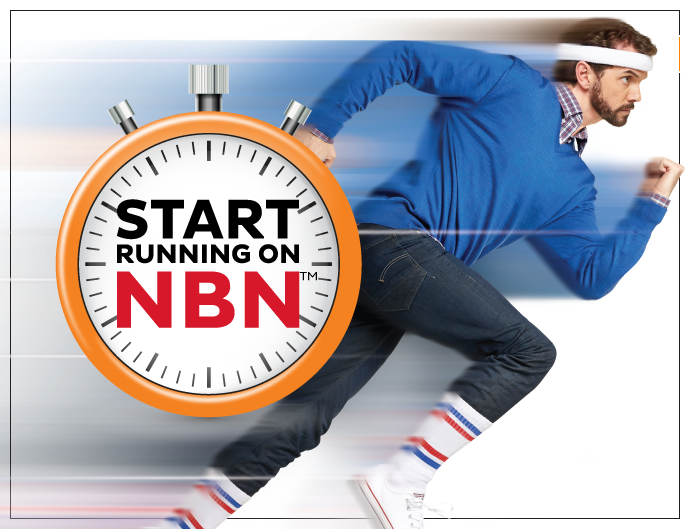 Jump on board and start running with iiNet NBN™! Not sure when the NBN™ will reach you? Head on over to our NBN™ Coverage Checker and enter your address. I am, however sick and tired of the constant lauding of the NBN in these blogs. Over the past several year we have had a barrage of them, but never a word about if and when we actually can get the elusive NBN in our end of town. We also never hear any talk about the lessening of the connections, as proposed by the politicians. I. e. first NBN to the node, then to the house and now, NBN to the kerb. Thanks for taking the time to ask about NBN. We can certainly appreciate your frustration here; the amount of advertising but with no payoff is certainly enough to become a source of dissatisfaction. As a result, we’ve taken the time to locate your details to update you on when NBN will be appearing in your area. In your case, NBN has your area slated to be connected via NBN HFC (Hybrid Fibre Coaxial), with construction stated early to mid 2018. Thanks for taking the time to get in touch here. We have noted your second post regarding the NBN visit that happened later in the day so we’re glad to see some progress has been made. Thanks for organizing a visit from NBN. Their previous visits have not produced a satisfactory solution. It would benefit NBN to have a phone no. for a customer to call back when the problem has not been solved. No listing in the phone book, nor any where else that I could find. I spoke with a senior NBN officer on talk-back radio on Friday. He offered to look in to my position and report back to me. No reply as yet. Your intervention caused some action. Their last technician to be involved said that there was a problem at the node and the work would have to be re-scheduled. Apparently 4 weeks of no service did not give them the message that the situation might be urgent. I am back again! This time with good news. Service restored last night, about 9.15.Some big downloads from Windows which seemed to be done very quickly. Config’n was done overnight. Start-up took 10 seconds this morning -has been taking 2 minutes. Bodes well if future downloads are done at that speed – approx 25MB/sec. Thanks to the Technicians and Support Staff. Thanks for keeping us posted here, Warren. We’re glad to hear it! Great to hear Warren – thank you for getting in touch once more! iinet Support spent ages trying to get some stability as it keeps dropping out. We even shared screens so that he could see what issues I was having. It worked for a day or so before giving all the frustration. This isn’t the experience you should be having, so we’d recommend making contact with our Support team and requesting that a fault be lodged. We can ask NBN to check the line between your premises and the node, as this is where any potential issues may lie. When will the NBN be ready for service at Lemonwood Cct. Thornton NSW 2322? We were first given a date of June 25 2017. That was changed to July 18 2018.Now there is no date-just says its in progress? Appears you’re right on the border! We’d recommend giving our Sales (13 19 17) team a buzz so we can securely grab your exact address and follow this up with NBN. 1. Do you guys have a no-penalty option to drop back to the speed tier that can be sustained? ie if I select your 5-25Mbps tier and only get 5Mbps (quite likely from what I hear) can I move to the cheaper plan with no penalty? 2. Do you have static IPs? We don’t offer static IP’s for residential services – these are only available to business connections. Regarding speeds, if the service is not working as intended, then we can always drop you back to a lower speed tier and our teams waive any downgrade fees. I have also had a similar experience with iiNet. Dropouts occur regularly and I have no way of even knowing if I can post this message before it drops out again. iiNet’s technical support used to be good but now it seems it’s outsourced to South Africa. The technical support team say the will follow up with NBN Co or ring back the following day and then fail to do so. iiNet even play the game of sending a text to say “we tried to contact you earlier, if you are still having problems contact Technical Support” as a way for them to put the ball back in my court after waiting for them to take action. There were no missed calls on my mobile so the text is just a cop out for taking action. I have asked them to revert me back to ADSL 2 over the copper telephone cables which was reliable but they haven’t let me do that. Therefore I am about to finally drop iiNet after a month of little or no NBN internet and sign up with another company. iiNet is bad but the Australian Labour Party who created this expensive NBN white elephant on taxpayers money is worse. Hello Brian, thank you form your comment. There’s a couple of things to address here so I’ll do my best. Once the NBN goes live in an area then no new ADSL services can be provisioned there. This is due to a cease sale being imposed on the wholesaler as part of the NBN rollout. It’s not a case of us not letting you swap back to ADSL2+, it’s that it simply cannot be done. I’m sorry to hear that our support team representative was unable to get through to you to follow up on your issue. If you’re still experiencing issues then we’ll certainly want to do what we can to assist, however if you feel you are not receiving the level of support you expect then you are welcome to ask to discuss your concerns with a senior member of staff as per our escalations process – https://iihelp.iinet.net.au/complaints_escalation_process. Lastly, our support team have had representatives in South Africa for many years, and they receive the same training as every other member of our support team. They will be happy to provide assistance with any queries you may have regarding your service. HFC-nbn connection. Telco plan/bundle charges for 25mbps. I never get 25mbps,17 to 23mbps (chromecast meter). If I buy specified measure of:- meat, fruit, alcohol,water,petrol etc. etc. I get that exact measure. Why not so in the hitech world of the internet/nbn/telcos? IINET NBN is great. Is what I would have said 2 months ago. But apparently just like every other ISP once people start to churn to them they suffer the same flaw all ISP’s suffer. They cheap out and don’t pay for enough connections from NBN co and so its insanely congested. I pay for 100/50Mbps and I connect at about 94/45Mbps my actual usable speed lately is sub 5Mbps. Even 3rd world countries have better internet. It sounds like there may be a throughput issue! We’d recommend getting in touch with our Support (13 22 58) team, Chayn. I have had at least a Decade of tenure with iinet stating out when they were first established in Western Australia. All I can say is I’m totally appalled, disgusted and constantly let down by you people now, and cant wait for my final contract to be over. Last 4 years, excuses, bad service, disgusting waiting time and then people who cant even understand my language let alone my grievances. NBN is slower than the ADSL2 I originally had, dropouts constantly I could go on and yes quite a rant. I’m a pensioner and your repeated sorry’s just don’t cut the cake anymore. My modem at moment is flashing like crazy and my speeds intermittent and below par. Sadly not looking forward to having to go through my new ISP connection mig-marole but to perhaps one day get a decently run, good customer service will be a consolation. Also for the so called quality of service the prices are dear and appalling. Hello David, if you are having issues with your connection speeds our support team will be more than happy to provide assistance and perform the troubleshooting necessary to identify and resolve the problem. You can reach them 24/7 on 13 22 58, and should there be a wait to get through our callback system is active throughout the day so that a representative will give you a call when they are available and you don’t need to wait on hold. P.S. My comment awaiting moderation ? Yeah know what that means. Sigh. We’ve since approved the comment and responded, David. Please, please stop espousing the benefits of the NBN. We are with iiNet (have been for 9 years) changed to the NBN and have had nothing but problems. Lack of speed and constant disconnections. I (personally) have sent hundreds of emails and spent hours on the phone with iiNet consultants without any fix to our issues. I pay for 100mmps and receive around a quarter of the promised speeds (25mbps). Last night 01/01/2018 our internet dropped out 12 times – again iiNet were unable to tell us the issue or fix the problem. As you can tell I am not impressed with the NBN or the iiNet pricing. We’re sorry to hear that your NBN connection is dropping out, with poor speeds being experienced. At this point, we’d suggest that we would need to consider lodging a fault with NBN on your behalf to have the issues investigated by an NBN technician, especially as this is also affecting your speed. Its likely that there is some sort of interference happening here. Lack of speed and constant disconnections are endemic of a line issue, so please have a chat to Support on 13 22 58 and ask them to lodge a fault on your behalf. IInet 24 hr support if you can get thru to them. I am a IInet customer with Adsl2 and seriously if you have a problem and call them you definitely need 24 hours to get thru to a operator, hence me leaving as soon as NBN is connected in my area to e nwe supplier. Nothing beats PAID advertising and FUD!!!! Apologies for any difficulty reaching us via the Support (13 22 58) line. We can also be contacted via asking a question in Toolbox (https://www.iinet.net.au/contact) or our social media channels such as Facebook and Twitter if you require assistance.